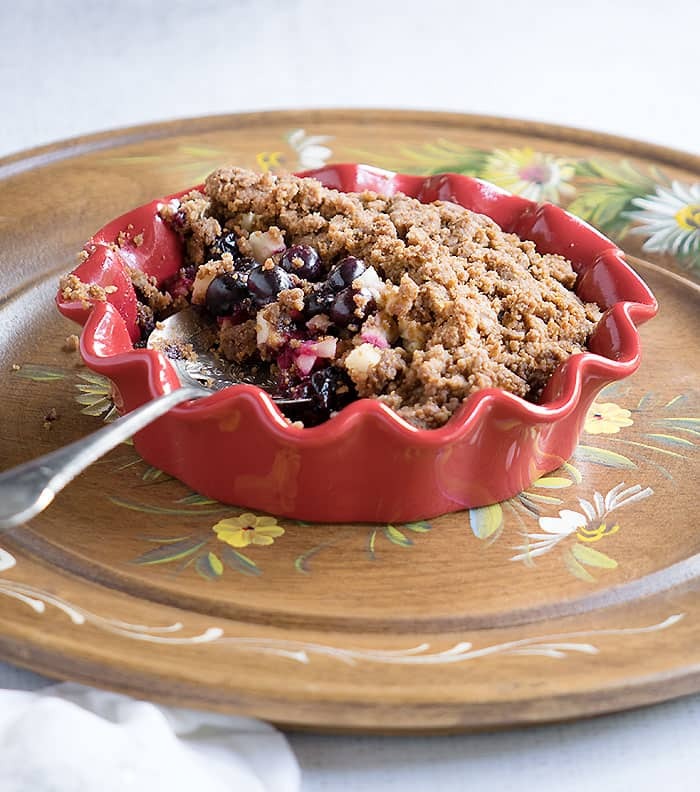 It’s always time for a fruit crumble, but I especially love adding fresh berries in all summer long. This recipe is made in your air fryer which helps your house not heat up. 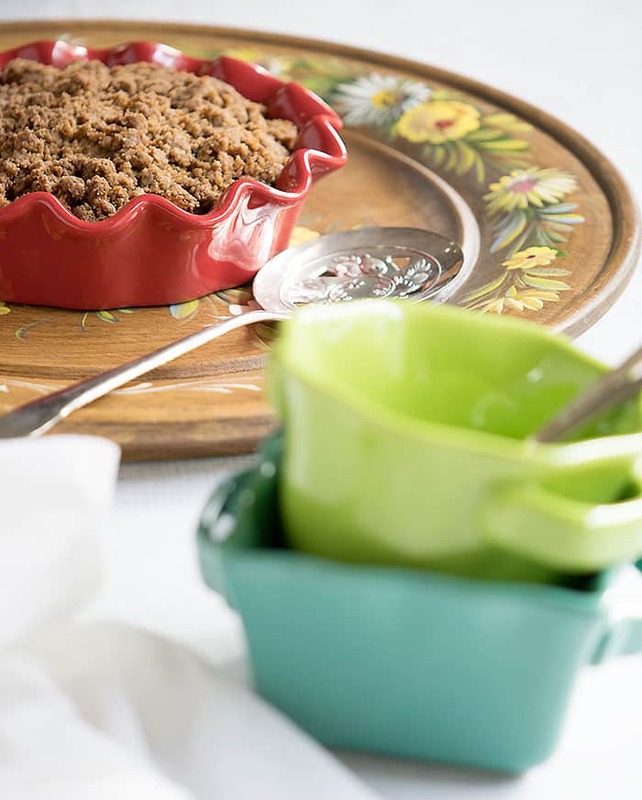 This recipe is from JL’s new book, The Vegan Air Fryer. You probably already know JL Fields from her blog, JL Goes Vegan, or one of her many books. JL turned the vegan community on to air fryers, and I started playing with mine because of her. If you are like me, you are already a member of her Vegan Air Frying Enthusiasts Facebook group, but if you have an air fryer please take a few minutes to join. JL’s book is a great introduction to air frying, and there are lots of no oil options. There’s a chapter on air frying 101 that will get you up and running if you’re new. There are staples recipes including a copycat vegan bacon grease. The breakfast recipes include doughnut holes, biscuits, and even a vegan slider garnished bloody Mary! There are starters and snacks, side dishes, main dishes, desserts, and one basket meals. So many recipes – just in time to use your air fryer all summer long. The Vegan Air Fryer is full of fun recipes like poutine, air fried pretzels, parsnip fries, corn dogs, tacos, lasagna, and recipes for homemade seitan. I think the book is a winner and encourage you to get a copy of your own! This is JL Fields recipe, but I know some of you will have questions, so here are some answers. No air fryer? You can bake it in your oven. Don’t eat sugar? Make this with the sweetener of your choice, to taste. Don’t use oil? Try subbing aquafaba or applesauce for the oil. 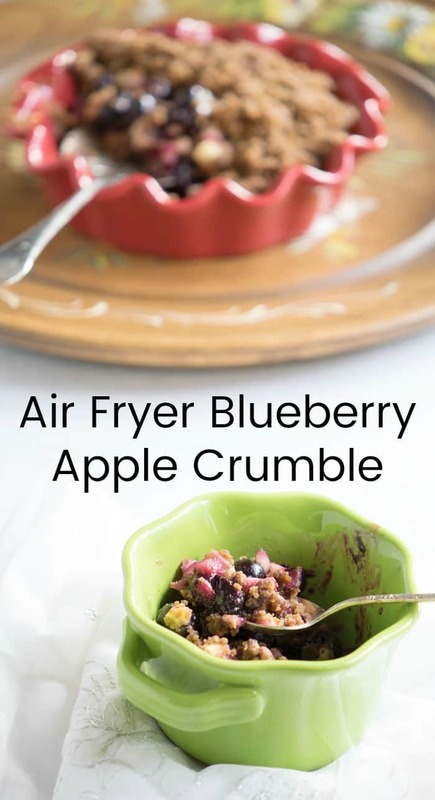 This delicious recipe is from JL Fields new book, The Vegan Air Fryer. This recipe is printed with permission. Preheat the air fryer to 350°F for 5 minutes. 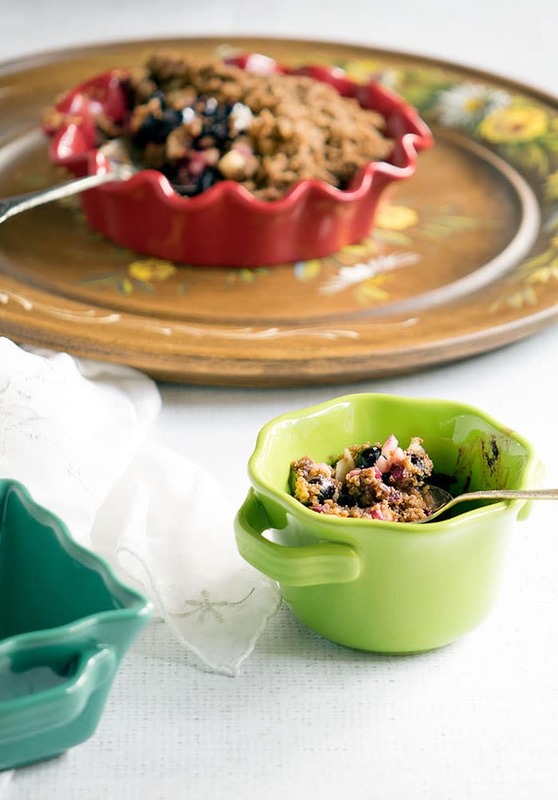 Combine the apple and frozen blueberries in an air fryer–safe baking pan or ramekin. 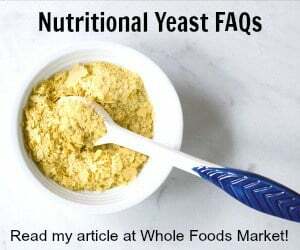 In a small bowl, combine the flour, sugar, cinnamon, and butter. Spoon the flour mixture over the fruit. Sprinkle a little extra flour over everything to cover any exposed fruit. Cook at 350°F for 15 minutes. So amazing! I LOVE my airfryer! I am glad I found this recipe! I am a vegan and I also just got an air fryer!!! This recipe looks great! I will try it soon! Thanks for the heads up, Lauri Kane. I zapped the blueberries and cut-up apples in the microwave for 2 minutes before adding the topping and baking in the air fryer. It worked perfectly.